The Pineriver H24 was most commonly sold as the Mini-X, and earlier versions came with 512MB RAM while later ones came with 1GB. This version was prone to overheating, and the case was redesigned, and then sold as the Mini XPlus. There have been many clones with different internals. Some with also an A10 inside (sometimes called MK805 or G1-TV), but some come with A10s (G1-TV-A10s or Semitime_g1_a10s) or A20. When these hit our community, they should be documented separately. 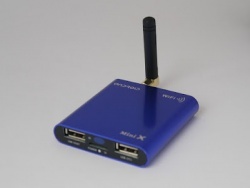 There's even a Jesurun device called MT Box which has a Rockchip in it. There is also a company called Minix. There is no relationship with pineriver and the devices are a different formfactor. For building u-boot, use the "Mini-X" target. For building u-boot, use the "Mini-X-1Gb" target. Use the sun4i-a10-mini-xplus.dts device-tree file for the mainline kernel. Pads for a button are present, but is not populated. You will have to trigger FEL mode through serial. You will need a special cable for the AV-connector. 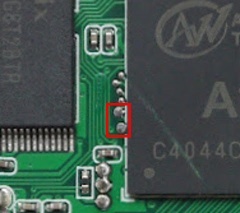 Remove the two screws at the back, and the board should slide out easily. 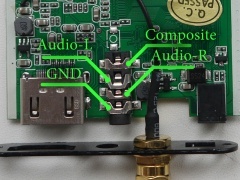 There are two pads right next to the SoC, just swap your lines until you have identified RX and TX, as described in the UART howto. This page was last modified on 12 April 2015, at 10:28.